What a day. I started by waking up about 5:43 AM (about, heheh), which was 17 minutes before my alarm was set. I had a job interview at 8:30. I went to the interview for a position working on tsunami geology. During the interview, everyone started getting phone calls and emails, there was an earthquake in Alaska. The main interviewer had to leave the interview to take a few calls. Pretty funny, before they left, they asked me what would I do. Perfect timing. We all broke out our phones and started reviewing the early reports and hypothesizing. I thought this may be related to the earthquake in 2016, though that was much deeper. Much has been written about this earthquake and I include tweets to summaries below in the social media section. 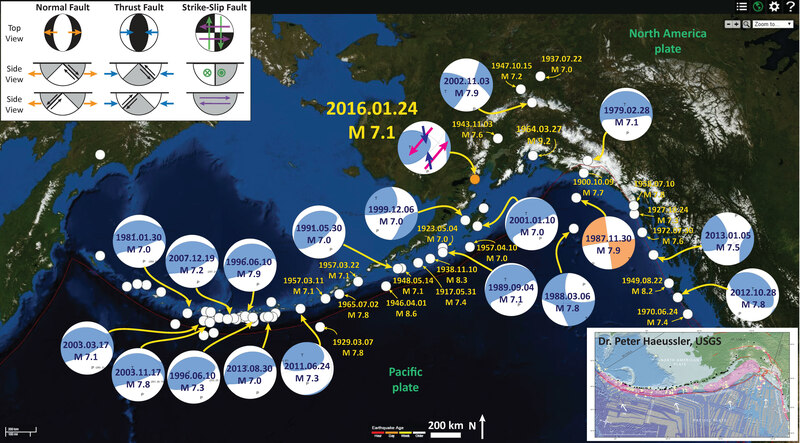 Today’s earthquake occurred along the convergent plate boundary in southern Alaska. This subduction zone fault is famous for the 1964 March 27 M = 9.2 megathrust earthquake. 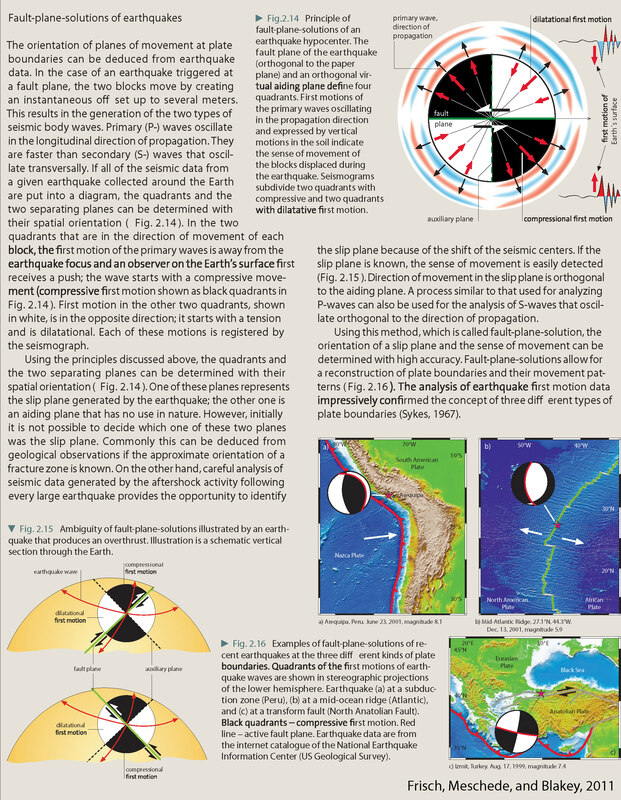 I describe this earthquake in more detail here. 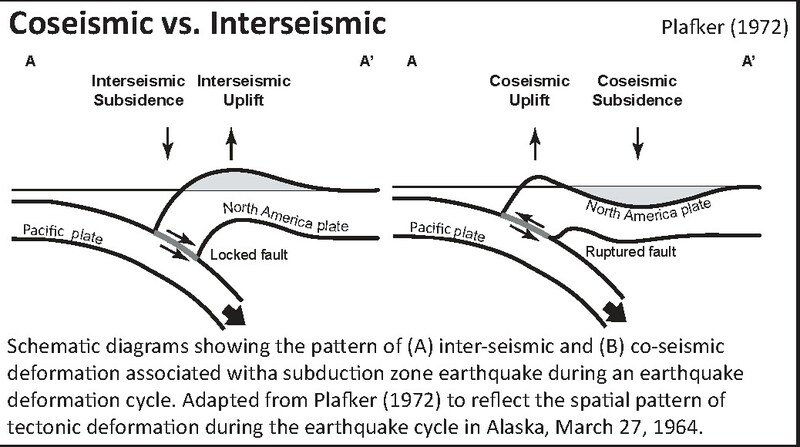 During the 1964 earthquake, the downgoing Pacific plate slipped past the North America plate, including slip on “splay faults” (like the Patton fault, no relation, heheh). There was deformation along the seafloor that caused a transoceanic tsunami. The Pacific plate has pre-existing zones of weakness related to fracture zones and spreading ridges where the plate formed and are offset. There was an earthquake in January 2016 that may have reactivated one of these fracture zones. This earthquake (M = 7.1) was very deep (~130 km), but still caused widespread damage. There was also an earthquake associated with the faults in the Pacific plate, which is still having asftershocks, earlier this year. Here is my earthquake report for the 2018.01.24 M 7.9 earthquake. I prepared two update reports here and here. Today’s earthquake was not on the megathrust fault interface and is extensional. I always have fun chatting with people new to subduction zones when we get to see an extensional earthquake at a convergent plate boundary. Because the earthquake was a normal earthquake (extensional) and it was rather deep, the possibility of a tsunami was quite small. However, there was a possibility that landslides could have triggered tsunami. However, these would be localized near the epicentral region. 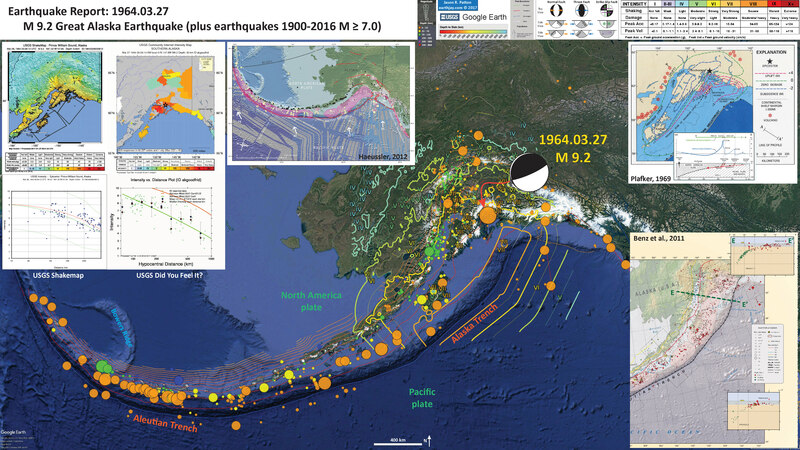 The earthquake appears to have a depth of ~40 km and the USGS model for the megathrust fault (slab 2.0) shows the megathrust to be shallower than this earthquake. There are generally 2 ways that may explain the extensional earthquake: slab tension (the downgoing plate is pulling down on the slab, causing extension) or “bending moment” extension (as the plate bends downward, the top of the plate stretches out. We can see the roughly east-west trends of these red and blue stripes. These lines are parallel to the ocean spreading ridges from where they were formed. 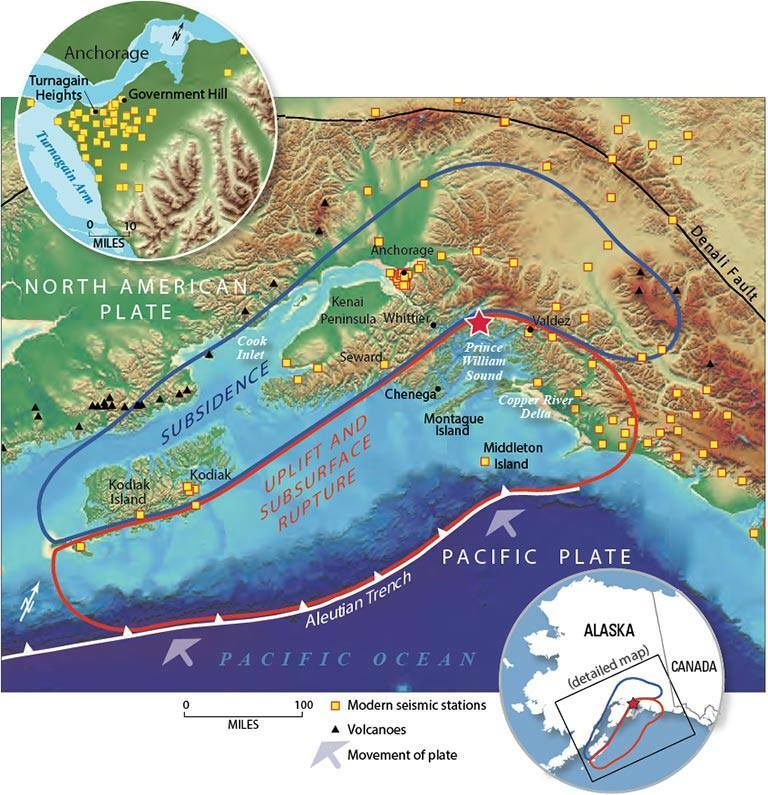 The stripes disappear at the subduction zone because the oceanic crust with these anomalies is diving deep beneath the North America plate, so the magnetic anomalies from the overlying North America plate mask the evidence for the Pacific plate. In the upper left corner is a map of the plate boundary faults from IRIS, which shows seismicity with color representing depth. I place a blue star in the general location of today’s earthquake (same for other inset figures). 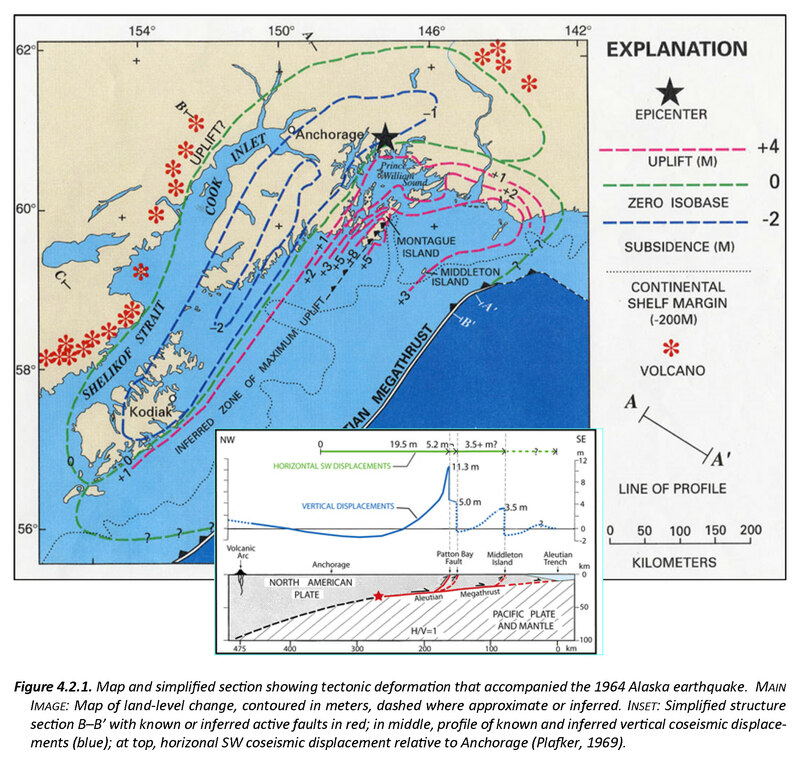 Below this map is a low-angle oblique view of the subduction zone. 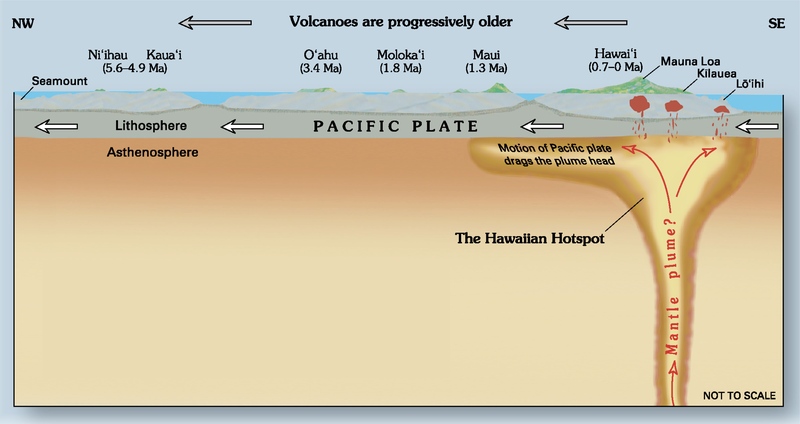 In the lower right corner is a map that shows the isochrons (line of equal age) for the oceanic crust of the Pacific plate (Naugler and Wageman, 1973). Compare these lines with the magnetic anomalies in the main poster. 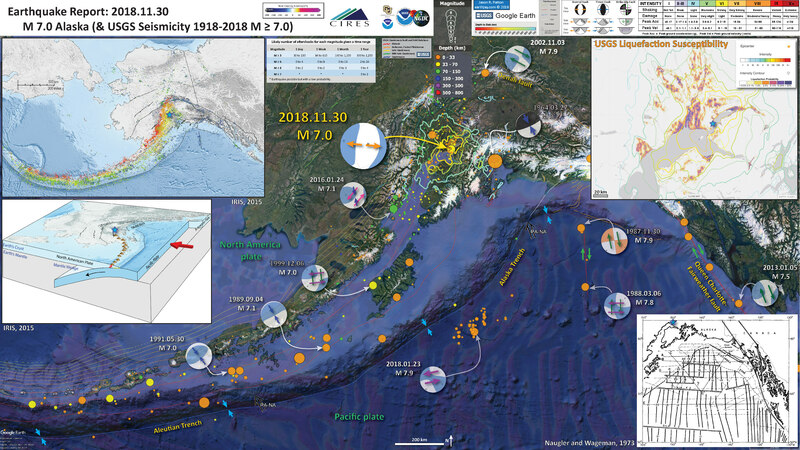 In the upper right corner is the USGS liquefaction susceptibility map which is now a standard map product for USGS earthquake pages (for earthquakes of sufficient size). There has been photos of road damage that appear to be the result of liquefaction induced slope failures. I presented this map product in my reports for the 2018.09.28 Sulawesi, Indonesia earthquake and tsunami. Another new product from the USGS is an aftershock forecast. GNS (New Zealand) has been doing this for a while (I first noticed these following the 2016 Kaikoura earthquake). I prepared a table from their data that lists the potential number of earthquakes for different magnitudes for different time periods. These estimates are basically based on the empirical evidence that aftershock size and number decay with time. Here is a map for the earthquakes of magnitude greater than or equal to M 7.0 between 1900 and 2016. This is the USGS query that I used to make this map. 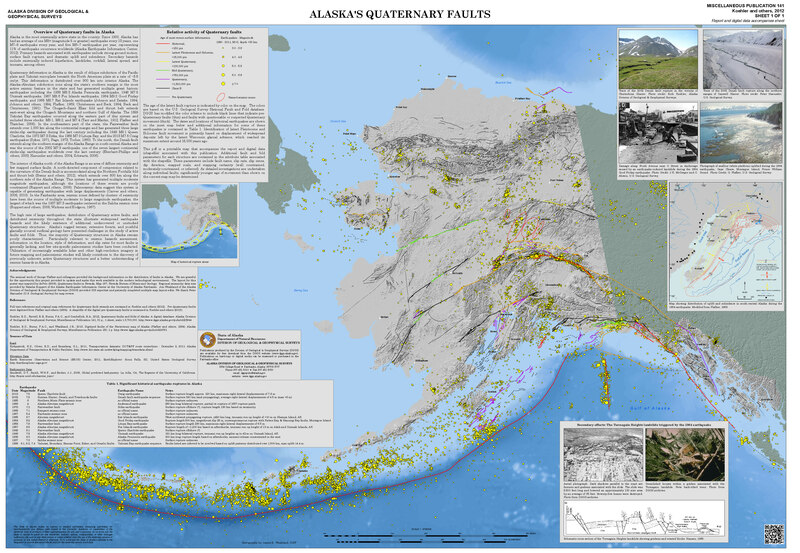 One may locate the USGS web pages for all the earthquakes on this map by following that link. This is a map from Haeussler et al. (2014). The region in red shows the area that subsided and the area in blue shows the region that uplifted during the earthquake. These regions were originally measured in the field by George Plafker and published in several documents, including this USGS Professional Paper (Plafker, 1969). I present more information about the 1964 Good Friday Earthquake here. Below is my interpretive poster for the Good Friday M 9.2 earthquake. Learn more about the 1964 earthquake here. 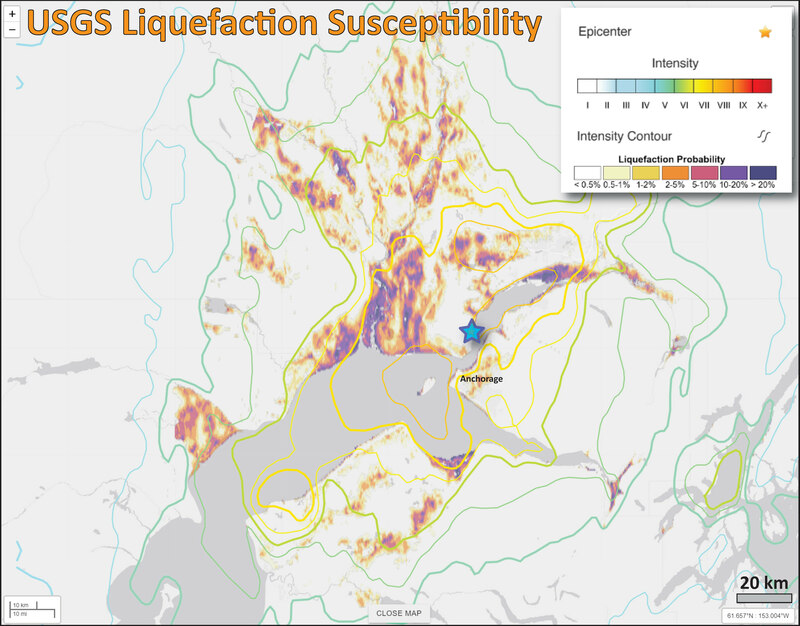 Here is the USGS liquefaction susceptibility map. Learn more about the background behind this map here.